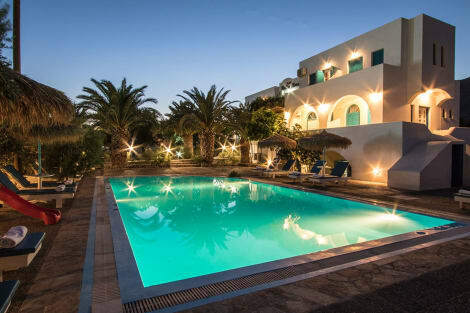 Within 70 metres from the black sandy beach of Perissa, Onar is a Cycladic-style complex with a traditional, furnished terrace enjoying views of the Aegean Sea. It offers free WiFi access in public areas, and air-conditioned accommodation with balcony. Onar rooms and studios are simply furnished and air conditioned. They all come with a mini fridge, a TV and a private bathroom with shower and free toiletries. Guests can have an evening drink at the terrace of the complex. The property's staff can happily assist you with the luggage upon arrival. Just a short walk from the property, guests will find a bus stop. The popular capital of Santorini, Fira, is 15 km away. Free parking is available nearby. Featured amenities include express check-in, express check-out, and luggage storage. For a surcharge, guests may use a roundtrip airport shuttle (available 24 hours) and a ferry terminal shuttle. When you stay at Villa Valvis in Santorini, you'll be near the beach, within a 5-minute drive of Perissa Beach and Perivolos Beach. This hotel is 4.7 mi (7.6 km) from Santorini Caldera and 6.2 mi (10 km) from Athinios Port.